Brioche buns are so “on trend” and burger restaurants up and down the country now serve them as standard. One thing I miss with most brioche buns is the crunchy sesame seed top. This recipe combines the rich, sweet brioche dough with a classic sesame seed topped roll. I’ve never been a confident bread maker. Too often I’ve had loaves that sound hollow when tapped but end up being raw on the inside. So, I’ve spent a lot of time over the last two years learning the craft. My other half Jon is a bit of a bread baking pro and I’ve been paying close attention to his weekly baking sessions. With his help I think I’ve finally cracked the humble bread roll and together we’ve come up with these awesome sesame seed brioche burger buns. So what makes this bun a brioche burger bun rather than your average bread roll? Believe it or not, brioche is a type of French pastry. In other words its an enriched bread. It is made with a much higher egg and butter content than you’d get in a normal bread dough meaning it has a rich and tender crumb. It is light and puffy and it has a dark, golden, flaky crust which is made by applying an egg wash after proofing. For the real baking geeks out there (of which I am one) brioche is technically a “Viennoiserie” (big word right…) which basically means it is made in the same way as bread, but with the extra “pastry” elements of eggs, butter, milk and sometimes sugar. Whoever decided that a brioche bun would work well with burgers and hot dogs was, in my opinion, a genius. I did have a good Google before writing this post but I couldn’t find a story of its “origin” anywhere on the internet! That’s a good claim to fame being wasted right there! Brioche burger buns have become so popular restaurants have been named after them (see Brioche Burger in East London) and almost all of the supermarkets now stock them on their shelves. But who wants store bought when you can have homemade? PLUS, most of the supermarkets leave off the sesame seed sprinkles on top! For me the rich fluffy bun is now an essential when creating over the top burger creations. Just last week we used the rich sesame seed brioche burger buns to sandwich together lettuce, a big slice of beef tomato, carrot coriander and chickpea burgers, shredded cabbage, tomato relish and a big old dill pickle! 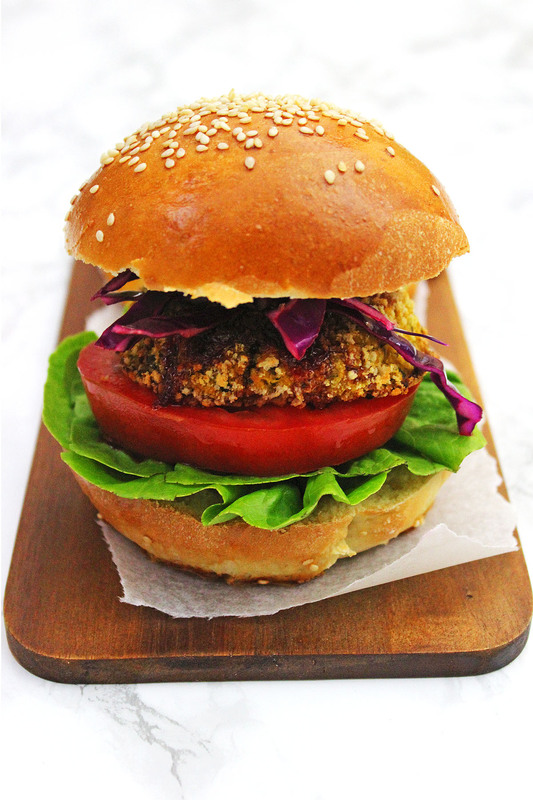 Veggie burgers don’t get better than that! These also work well for beef burgers, chicken burgers, portobello mushroom and black bean burgers. Any other type of burger you can possibly think of really! Be prepared to get a little bit messy with this one. Bread is always a very hands on bake and this recipe is no exception. The dough can be a little sticky at the start. In measuring jug, combine the warm water, milk, yeast and sugar. Give it a good whisk and let it rest until the yeast activates and a bubbly foam appears on top (roughly 5 minutes). In a large bowl, add the flour, salt and butter. Rub the butter into the flour (as if making pastry) until breadcrumbs have formed. Stir in the yeast mixture and one of the beaten eggs. Bring the dough together into a ball then knead on a lightly floured surface for 10 minutes. Place back into the bowl and leave it to rest in a warm place with cling film over the top of the bowl for roughly 2 hours or until it has doubled in size. In the meantime, line a baking sheet with grease proof paper. When the dough has doubled in size place the dough on to a lightly floured surface and knock the air out of it. Divide the dough into 8 equal pieces and shape them into balls, rolling until they are smooth. Place on to the baking sheet leaving a gap (roughly 5cm apart). Cover loosely with cling film and leave in a warm place again to rise for roughly 1.5 hours. When the buns have risen again, beat the remaining egg and gently brush each roll with the egg wash.
Preheat your oven to gas mark or 200C. Immediately before baking, place an oven dish in the bottom of the oven with an inch of water in the bottom (this will create steam as the buns bake). Place the buns in the centre of the oven and bake for about 15-20 minutes or until golden brown. Turn the buns out on to a wire rack to cool before eating. I know I’m biased but don’t these look amazing?! Once you’ve made them yourself you really won’t go back to buying them ever again. What type of burger would you stuff in your Sesame Seed Brioche Burger Buns. Let me know in the comments below. I absolutely love Brioche buns, the sweetness of the bun contrasting with the salty, savoury filling is so good. I’m impressed by your Viennoisserie, madame – get in! Thanks Janice 😀 I am super super proud of this recipe! So pleased to have finally nailed it! Oh Emma, you have definitely mastered the art of bread making. These look incredible. 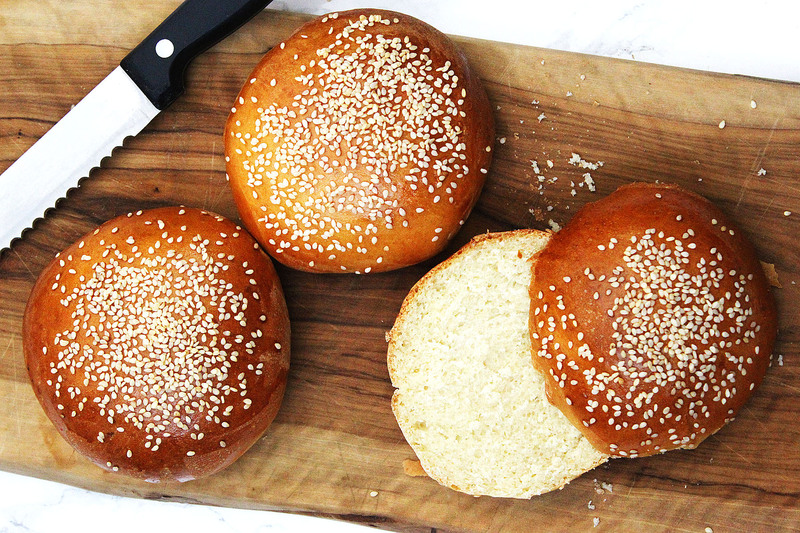 I love Brioche buns and love the addition of the sesame seeds for extra texture! Yum! Those look delicious – so perfectly golden. Burgers are universally better when served in a brioche bun! Fact! Lovely recipe and it really is worth the time to make them. i am like you too!! I love my burgers encased in sesame brioche buns! I know this chef, who bakes beautiful beautiful artisan breads. Your buns would look perfectly happy there! Oh, brioche buns are definitely my favorite for burgers when I eat out (I usually serve them bun-less at home). They’re soft, absorb the toppings well, and don’t overwhelm the burger with too much bread. Oh, and I really really really need to take a bread making 101 class so I know how to work with dough. I’m such a noob! I was thinking I might take a class too Elaina but they are all so expensive! I’ve found practice really does make perfect. These are SO beautiful! I’m not a great bread maker myself, but I do love a good brioche bun. Pinning these to give them a try! Thank you Tracy! I hope you love them as much as I do! Hi Natalie! They are awesome aren’t they. First time I had a brioche bun I wondered why I hadn’t sooner :-p definitely give the recipe a try you won’t regret it! This is always our bun of choice on burger night and I have never made them myself. Who knew they were so simple. Definitely giving them a try for our next BBQ. Oooh yes you’re right. I love brioche burger buns but I do also love the sesame seeds on classic non-brioche buns. Great idea to combine them! Hey Karyl, you’re right it is a very similar process to a regular loaf of bed 🙂 Let me know if you do make them! I LOVE homemade bread, and these buns look fantastic. Nothing beats the aroma of bread cooking, and these delicious buns would be great for sandwiches too. Hi Gloria. They are very versatile – definitely not just for burgers and youre right, sandwiches would taste great made with these buns! Wow, I’ve never tried to make brioche buns – but it looks like I totally should! These look amazing! They are well worth the effort! I absolutely love brioche bread. I’ve never actually had a brioche bun before though. I bet it tastes so good! I also love how easy they sound to make. These look delicious! So perfect for summer cookouts right now. Can’t wait to try it out! I love Brioche buns and love that you served them with Burgers!! I thought I was crazy to do that. It’s weird but I love sweet buns with my burgers too!! Ha honestly looking at the recipe I was like “omg she’s so thoughtful!” because honestly, the normal brioche buns miss the sesame seeds on the normal burger buns but this is the best of both worlds! Thank you! Your brioche buns are beautiful sure they are delicious. I need to try this. It has been long time I did bread baking. Great with any burgers.